Hercules is a large but faint summer constellation. 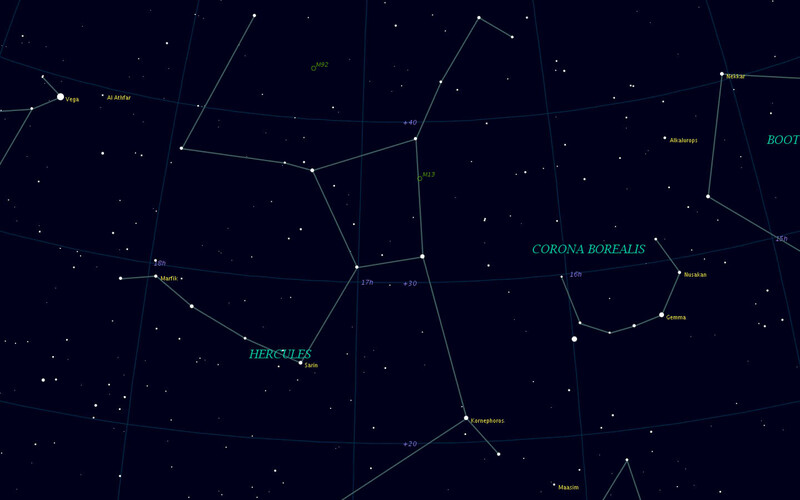 Between Vega and Arcturus lie two constellations, Corona Borealis and Hercules. While the complete asterism of Hercules is difficult to trace, a distinctive lopsided rectangle or parallelogram is noticeable between Vega and Alphecca, slanted downward from left to right. This group of four stars is made of pi and zeta Herculis to the north and delta and beta Herculis below them. Pi Herculis is particularly noticeable for its reddish complexion and is an excellent place to begin studying the constellation. Alpha Herculis (Ras Algethi) is a supergiant, over 500 times the size of the Sun. It's also a binary and a variable star. Alpha Herculis is found in the same field as alpha Ophiuchi. Alternatively drop southwest of Vega thirty degrees (four full fields). Beta Herculis (Kornephoros) is just as bright as alpha Herculis. Both beta and gamma are NW of alpha by two fields. It might be easier to find beta by dropping south of zeta two binocular fields. Having found gamma in the same FOV as beta, if you place gamma at the upper edge of your glasses you now find kappa Herculis, a binocular double with an interesting colour contrast: 5.0, 6.3; yellow and copper (or bronze), a position angle of 12� and a separation of 28". Mu Herculis is another convenient star with an interesting neighbour. The binocular view of mu reveals a distinctive asterism, a truncated triangle and the solitary mu to the west. Among the stars here is the striking binary of two identical white stars, 100 Herculis, 5.8, 5.8; 183� and separation 14", best suited for small telescopes. Pi Herculis is a reddish star with a magnitude of 3.2. The star forms the northeastern corner of the 'keystone' of the constellation, the central quadrangle. It's easiest to find pi first with the naked eye -- it's midway between Vega and Alphecca. The binocular view of pi reveals an interesting asterism which is a handy point of repair should one become lost amongst the other stars in Hercules. From pi you can find the other corners of the 'keystone', the lopsided square that forms the centre of the constellation. To the southwest a little over a binocular field are zeta and epsilon, while to the east-northeast of pi barely one binocular field (that is, just out of the same field with pi) is eta. Zeta Herculis is a binary with a companion which makes one revolution every 34.5 years. The star forms a corner of the 'keystone' of the constellation, the central quadrangle. To find zeta, move southwest eight degrees from pi (the easiest star to find in this part of the skies). Zeta and epsilon (seen in the same field) form the southern portion of the 'keystone', the lopsided square that is the most recognisable feature of the constellation. The keystone is too large to get more than two stars in a binocular field at one time. Further to the north of zeta is eta, which forms the northwest corner of the keystone. In the same field as eta Herculis is the bright globular cluster M13, a splendid globular cluster thought to be about 10 million years old. A fine sight in binoculars, but it takes a small telescope to resolve its stars.